Metalworkers need reliable tools for shaping, cutting, forming, and finishing metal parts and products. Calipers and scribers are great for measuring and marking materials, and tools like pliers, punches, hammers, and hacksaws can be found on many workbenches. Some metalworkers use production machinery and equipment, but electric hand drills and bench vises are common enough, too. Reamers and other cutting tools are great for enlarging holes in pipes and removing metal from cylinder walls. Rigid hones are used for cylinder resizing and heavy-duty material removal. Honing stones are recommended for initial honing (such as with OEM engine cylinders), but there’s a better way to achieve a final finish. For both new and used cylinders, metalworkers use the BRM Flex-Hone® tool. Made in the USA by Brush Research Manufacturing (BRM), the Flex-Hone® is a flexible, resilient honing tool with a soft cutting action. BRM’s flexible cylinder hone features abrasive globules or balls that are permanently laminated to flexible nylon filaments. This metalworking tool is available in standard sizes from 4mm to 36”, and in 9 different abrasive types (including diamond) and 11 grit sizes. Unlike a rigid hone, which has only two or three stones, the Flex-Hone® has hundreds of cutting points for a full 360° of cutting action. Rigid hones can produce a rough surface finish with high, sharp peaks. By contrast, flexible hones round and reduce peaks to a consistent height while creating a uniform series of valleys. Flexible honing’s plateau finish supports optimum lubrication and reduces friction and wear. Flexible honing also puts little pressure on cylinder walls, which means the tool won’t gouge out metal and cause torn or folded-over edges. Plus, since pressure against the cylinder wall is equalized, users don’t have to worry about making cuts in both directions. Importantly, flexible honing imparts a uniform surface finish along the length of the entire cylinder. Honing stones can impart an uneven or unidirectional crosshatch pattern that requires users to reduce pressure on the tool at the top of the cylinder. Metalworkers also like the Flex-Hone® tool because it’s long-lasting and self-compensating for wear. 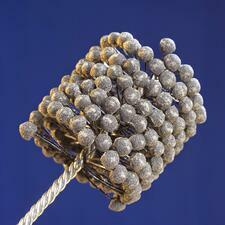 As the tool’s abrasive globules wear, fresh cutting particles are exposed. This means that the abrasive that’s needed is always at the outermost edge of the Flex-Hone®. By contrast, honing stones can wear out quickly. For a superior final finish that removes burrs and keeps bores at the precise dimensions required, metalworkers trust the BRM Flex-Hone® tool. Flex-Hone® tools do not require special training, expensive equipment, or complex setups or cleanups. They’re designed for handheld power tools such as electric drills, and can be used with your other existing machinery and equipment. If you’re headed to IMTS 2016 in September, request a meeting with the BRM technical team to ask questions and get answers about this industry-standard metalworking tool. Can’t wait for IMTS? Not headed to the show in Chicago? Then watch this video to see how to use the Flex-Hone tool with a handheld drill, or watch this video to see how to use the Flex-Hone® with an in-machine setup. Download the Flex-Hone® Resource Guide, too. This free, full-color guide contains what you need to know about Flex-Hone® selection and use.